Mozambique. Denver, CO. Washington, DC. Guatemala. Burlington, VT. Tanzania. Belgium. Ghana. New York, NY. What do all of these places have in common? You guessed it. Friedman students from the class of 2013 completed summer internships in all of these places around the world, and in many others. As summer comes to an end and students return to Boston for the new school year, stories abound about internship experiences. Students completed internships in areas ranging from irrigation technology to workplace wellness, from Congressional policy to organic farming, and from biochemical research to consumer writing. No matter what the experience, these internships gave students the opportunity to put their Friedman learning into practice and to gain valuable insight for their future careers. We have featured three students’ internships, highlighting one from each program at Friedman that requires a summer internship – Food Policy and Applied Nutrition(FPAN), Agriculture, Food and Environment (AFE), and Nutrition Communication (NUTCOM). These personal accounts give a look into some of the exciting things students were doing this summer. In October or November, there will be an official internship session at Friedman, with presentations from students in each program and an opportunity to speak with them about their experiences. This summer I worked at International Development Enterprises (iDE), an international NGO whose work focuses mainly on water issues faced by the rural poor in developing countries. Most of iDE’s projects are aimed at low-income smallholder farmers, with one of their main focuses being low-cost micro irrigation technologies (MIT) and water storage systems for agricultural applications. iDE’s head office is located in Golden, Colorado, and they currently operate in eleven countries in Africa, Asia, and Latin America. The job title for my internship was Appropriate Technologies Researcher, and the main objectives of my work had to do with furthering the development of a new low-cost gated pipe irrigation technology that aims to increase water use efficiency and decrease the labor requirements for smallholder farmers that are currently using manual treadle pumps to irrigate their plots. 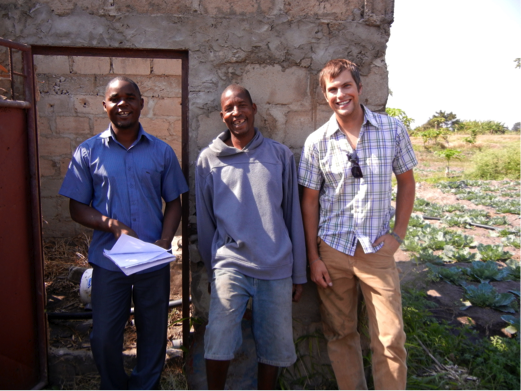 In order to complete these objectives my summer was split into two parts – a six-week period at the head office in Denver, followed by four-weeks of field work in Mozambique working with farmers to test the new irrigation system, gather user feedback, and to research supply chain development issues associated with the introduction of a new irrigation product. In Denver I worked with iDE’s engineering team to create prototypes of the new irrigation system and to construct a small test plot. I was also in charge of researching the availability of the various materials and components of the system in different regions where iDE operates, and creating instructional materials for the farmers that would be using the system. 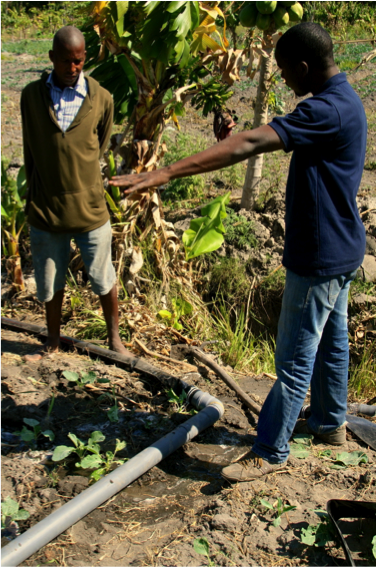 In Mozambique I worked with a team of irrigation engineers and agronomists to identify farmers that might be interested in using the new system. We then worked with these farmers to set up demonstration plots, and to train the farmers and farm workers on how to use and maintain the system. We performed follow-up visits to address any issues the farmers were running into with the system, and to answer any questions they might have. In return they provided us with feedback on which aspects of the system they liked and disliked in order to help iDE modify the system and to make sure it was effective and that it met the needs of the farmers. This summer made me realize the importance of a multi-disciplinary education, and it gave me an even greater appreciation for the skills and knowledge that I have acquired through the AFE and WSSS programs at Tufts. Many of the issues that we are working to address at the Friedman School are extremely complex, so the ability to analyze and approach these issues from multiple angles in order to find creative and lasting solutions is invaluable. Spending a majority of my time working with farmers in the field was a great way to supplement what I’ve learned in the classroom and to apply many of the skills that we are acquiring at Tufts. I appreciate the emphasis that the Friedman School places on gaining real-world experience through summer internships, and I am extremely grateful for the financial support provided by the Friedman School and by the Leah Horowitz Memorial Fund that helped make my summer possible. Elliot also spent the first four weeks of the summer working with fellow AFE students Kate McMahon and Maggie Holmes in Palestine through the WSSS program, setting up a water quality testing program with residents of a refugee camp in the West Bank. If you want to hear more about this incredible experience, he’s happy to talk about it! 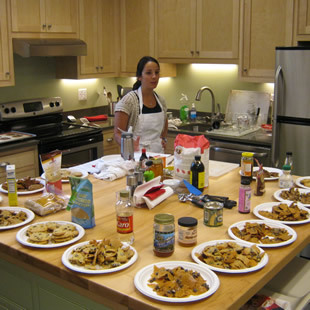 I interned with EatingWell Media Group in Shelburne, Vermont for 10 weeks this summer. EatingWell is a magazine that publishes healthy, seasonal, whole foods recipes and the latest nutrition science and research. I worked directly with Brierley Wright, a Friedman alumna and current Nutrition Editor at EatingWell, and also with many of the other editors and members of the business team at EatingWell. I was put to work from day one, in a good way, working on projects ranging from researching articles for the online and print magazine, working on meal plans for diabetics and heart health (to be published, and also sent to their business partners) and baking cookies in the test kitchen. I always felt like I was working with a team, as opposed to beneath them, and the people there could not have been nicer. I had a lot of independence to work on projects, like taking the lead on an article on the health benefits of tea. I was also excited to learn that a few short pieces I wrote would be featured in the magazine and on the web, such as this article on natural sweeteners. My favorite part of the internship was probably getting to test all the pie for the holiday issue of the magazine. Yum! Other than that, it’s hard to pick a favorite because I loved everything about the internship. It was very interesting and a great experience for me to see the magazine be put together with all of the components involved. When I first started at EatingWell, they had just finalized the July/August issue, and during my time there I got to see the September/October issue come together from start to finish. What started out as just ideas became rough drafts, and these were edited and styled over many versions to what became the September issue. I learned a lot about how much goes into publishing and also everything else they do at EatingWell. The writing classes I took during my first year at Friedman were extremely helpful, given that I spent a lot of time researching and writing at EatingWell. It just so happened that I wrote a piece on sugar during one of my classes, and EatingWell’s nutrition feature article was all about sugar. I wrote a sidebar for the piece on different types of sweeteners, and already having some of that research and knowledge from the school year came in handy. Other than that stroke of luck, I think my first year of Friedman taught me to multi-task and prioritize, both of which were very helpful for my summer internship. 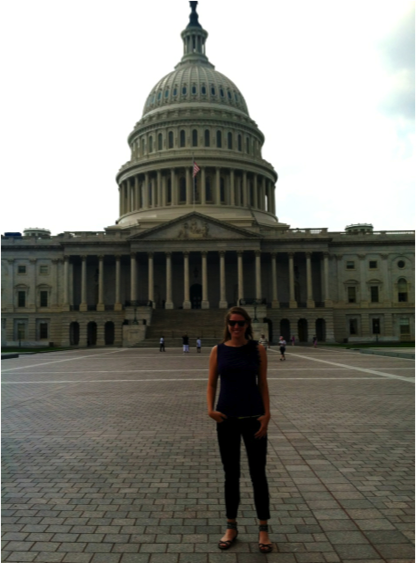 I spent this summer working with the National Sustainable Agriculture Coalition (NSAC) in Washington, DC. As the policy intern I was able to really experience the whirlwind that has been the 2012 Farm Bill process. I was able to sit in on meetings with Congressional offices and hear discussions over ideas for legislation that would be proposed for the agriculture committees’ bills. I went into work early to sit in line (among professional line sitters, I might add) so NSAC could get a spot in the House Agriculture Committee’s hearing room. When the bills were on the floor, we all stayed late at the office to count votes and I would rush home to finish watching on CSPAN. If someone had told me in advance that that’s how I’d be spending my summer, I might have told them I wasn’t enough of a wonk to enjoy it, but I definitely did. I also got the chance to go to Nebraska for NSAC’s annual summer meeting of its member organizations. Over 70 people from leading groups in the sustainable agriculture world came together to lay out their plans and form collective priorities for the next six months. It was inspiring, challenging, and lots of fun to be with such amazing people doing innovative and meaningful work across the country. The best part of the whole experience was my colleagues, all of who impressed me on a daily basis. They are such bright, inspired, hard-working people and having the opportunity to work with them really caused me to rise to the occasion and meet their expectations. That being said, they are also amazingly fun, and we all danced late into the evening one night in Nebraska. I can’t say enough about how much I enjoyed my time at NSAC this summer and I feel excited about my future in food policy. Read Sarah’s summary of the 2012 Farm Bill process and status in her article Farm Bill 2012 – Where (if Anywhere) Is it Headed? Ashley Carter is beginning her second year in the Nutrition Communication program at the Friedman School. She is also completing her DPD at Simmons College in order to become a RegisteredDietitian. She spent her summer in Boston doing an internship in workplace wellness and is excited to swap internship stories with her classmates when she returns to school.